Back pain is some the worst pain you can ever deal with. This is because the majority of the movements you make are in some way connected with your back. If you are currently dealing with back pain, you know firsthand how disruptive it can be. Some of the most severe back pain you feel can come as a result of a compression fracture.Compression fractures happen when a person has a relatively minor trauma, but they are also dealing with osteoporosis. Osteoporosis leaves your spinal vertebrae weak, brittle, and susceptible to fractures. A spinal compression fracture can also happen if you have a spinal infection, a tumor, or serious spine trauma. Before the procedure is performed, you will be sedated but still awake. It can be done in an x-ray suite or in an operating room. The procedure starts with you laying face down on a table. This allows for improved vertebral alignment, especially when compared to the way your vertebrae would align if you were standing and had an unstable or acute fracture. X-ray machines are used to guide a thin needle/cannula into the vertebra. Then a cement specially designed for bones is injected into the fracture. It takes about 10 minutes for the cement to harden, solidifying the fragments of fractured vertebra and giving you stability and pain reduction. During the procedure, the doctor will not manipulate your vertebra. They will simply place the bone cement into the fracture site to give stability. In most cases, this procedure is performed with general anesthesia. In some instances, the doctor may opt to use a local anesthesia, but that is rare. This procedure begins with you lying face down on an operating table. Then a balloon catheter that is comparable to the balloon catheter used in angioplasty is carefully placed in the vertebra. The doctor will use an x-ray machine to guide the balloon catheter. Once in place, a pressurized liquid inflates the balloon. Vertebra that have collapsed as a result of fractures are restored to their proper place. Once the balloon has been inflated, it is deflated and removed. The space that the balloon made between the vertebra is filled with a bone cement. As the cement hardens, it keeps the vertebra in its proper position and prevents collapses and wedging. Vertebroplasty and Kyphoplasty procedures are minimally invasive. They are safe, yet as with any medical procedure, there are some inherent risks. Most risks revolve around unforeseen complications with the cement injection. If the cement leaks into the spinal cord before it has a chance to dry, it can compress nerves, create new pain, and create new neurological problems. In rare instances, the cement has led to pulmonary embolisms in the lungs and even death. 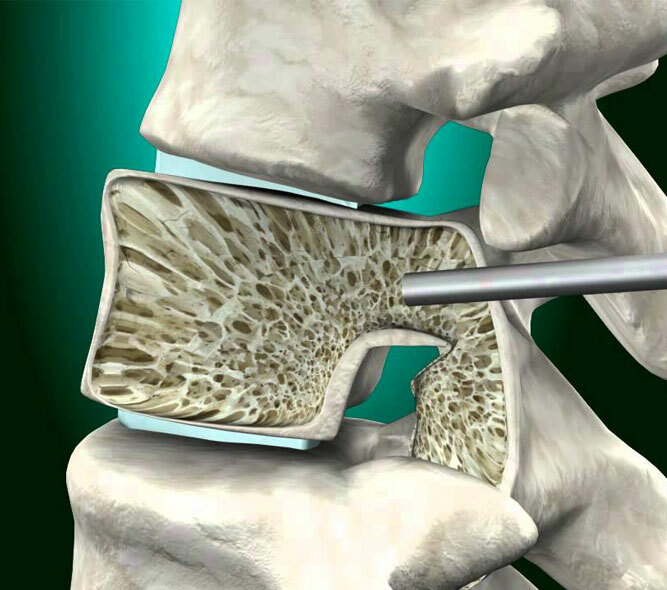 However, the vast majority of vertebral body cement injections go off without a hitch. They are very useful in minimizing or removing the pain and discomfort associated with vertebral compression fractures. Dealing with the pain of a vertebral compression fracture is life altering. It affects the way you move, the actions you can engage in, and the way you feel when you are around friends and family. We understand how challenging it can be to deal with these severely painful conditions. For this reason, our goal is to work with you to help you find the best pain management solution possible. To this end, when you walk into our clinic, the very first thing that we are going to want to do is to sit and talk with you. We want to hear about your pain, the steps you have taken in the past to reverse your pain, and what your pain management goals are for the future. Something that we have clearly seem is that no two people experience pain in the same way. No two people respond in the same way to treatments. So there is no one size fits all pain management treatment. For it to be effective, pain management must be individualized. Once we have your situation clear in mind, we will then start to work with you to create a short-term and a long-term pain management program. In the short-term, we just want to get you up and moving pain-free. We want you to get back to living life in a happy way. Our long-term goal is to teach you how to live a pain-free life for years to come. It is likely that before visiting us you have spoken to multiple medical professionals. Undoubtedly, some of them have given the impression that your pain is exaggerated, it is imaginary, and it cannot be treated. We do not believe any of that and neither should you. We are committed to helping you every step of the way as you work toward living a pain-free life. Contact us today, and let us show you why so many people trust us with their pain management needs.